The meditation day with Venerable Aloka at Hamblin Hall was a very inspiring and varied day, combining led sitting meditation sessions with walking meditation in the garden, breathing/energy alignment exercises and even meridian massage exercises. For everyone who would have liked to join us there will be another opportunity to spend a retreat day with Ven. Aloka on Saturday 20th November in Southampton, so please go if you can. There is a PDF poster for it posted in the ‘Files’ section of the forum, and if you are able to email it or print it out and circulate it to anyone interested then please do so. We were able to raise £150 as donation for Aloka (a self funding monk, not supported by any monastery or organisation) and £72 was raised for the rent of Hamblin Hall for the day. 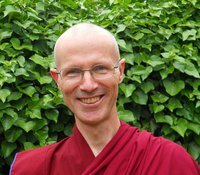 Aloka is Ringu Tulku’s own Bodhicharya monk and so it is a real privelage for us that he is able to share his great wealth of Dharma experience with us. There was even a very auspicious double rainbow across the Chichester harbour and Bosham as we were leaving! Thanks especially to Alison and Margaret for organising both events, and I am sure we will be able to share more splendid BBG Dharma days like this in the future. We will be having a bring and share finger buffet. We have lots of chairs, please bring a cushion if you need one. Tel: Rigul Trust 023 8046 2926. The day is offered freely. 100% of any donations received will be offered to Venerable Aloka. All can be gift aided through Rigul Trust. This entry was posted on November 18, 2010 at 7:35 am and is filed under Teachings. You can follow any responses to this entry through the RSS 2.0 feed. You can leave a response, or trackback from your own site.